GARDAÍ HAVE DISCOVERED a body in the search for missing woman Jastine Valdez. The body has been removed from the scene this evening, RTÉ reports. A note was also found in a black Nissan Qashqai which gardaí are currently examining. 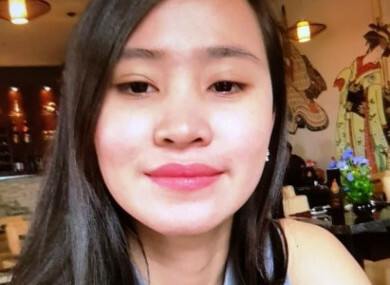 24-year-old Jastine Valdez was reported missing on Saturday night after she was believed to have been forced into a car on the R760 near Enniskerry in Co Wicklow. Last night a man wanted in connection with her disappearance, named locally as Mark Hennessy, was shot dead by gardaí after an altercation with officers at Cherrywood in Dublin. It is understood he was armed with a knife at the time. Searches continued this morning at a number of locations in south county Dublin, including a disused golf course in the Puck Castle area. Gardaí have confirmed a body was located in this area. It is understood the body was found in an area of thick gorse and it will take time to retrieve the remains. No formal identification has been made and gardaí appealed for privacy for the woman’s family. They also thanked the public and the media for their assistance and the Defence Forces and Civil Defence for their help with searches today. Investigators had used CCTV footage, phone data and location information downloaded from the satellite navigation system in the man’s car to track his movements between Saturday evening and Sunday night. Local Fine Gael Senator Neale Richmond said the community is “shaken by this horrendous news”. “It’s an area I know well, right on the Dublin/Wicklow border, close enough to where I live. It is a relatively rural area, but very settled and peaceful. It’s chilling to think something so awful could happen here. Gardaí have appealed to anyone who was in the vicinity of Pucks Castle Lane, Murphy’s Lane, using Carrickgollogan Forest Recreation Area or anyone who was in the vicinity of the lead mines in Kilternan from Saturday at 6pm to Sunday at 8pm and who may have seen anything suspicious and in particular the black Nissan Qashqai 171 D 20419 to contact them. They are also seeking assistance from hillwalkers or cyclists or anyone who may have driven through these locations and may be in possession of a dashcam that was operating during this timeframe to contact Bray Garda Station 01-6665300 the Garda Confidential Line 1800 666 111 or any Garda Station. - With reporting by Garreth MacNamee and Paul Hosford. Email “Body found in search for missing woman Jastine Valdez is removed from scene”. Feedback on “Body found in search for missing woman Jastine Valdez is removed from scene”.